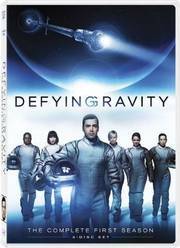 Some people may remember this short lived space drama from 2009, when it aired on BBC2 following a run in America, others will be confused as to why there is a full DVD about a song from a musical. From the producers of Grey's Anatomy and Desperate Housewives, it focused as much on the relationships of the crew as the strange goings on around them. Alas, we've had to wait until now to see this again, the series was cancelled due to poor ratings. So thanks to Medium Rare Entertainment for bringing us a 4 disc DVD box set on 25th February of Defying Gravity. With a total runtime of around 560 minutes, extras will include Mission Accomplished: A Look At The Making of Defying Gravity featurette, deleted scenes and stills gallery. The recommended retail price will be £34.99. The series follows the adventures of eight astronauts on board the international spacecraft Antares as they undertake a mysterious, six year mission covering 8 billion miles. Led by veteran astronauts Ted Shaw and Maddux Donner, every action of the crew of the Antares is scrutinised and beamed back to earth. However, there is more to this mission than the crew realise: something that is altering the crew at the very basic genetic level; something that the select few who know about it are desperate to keep a secret.